Click on the icons below to download PDF literature files. Tower cells provide COOLING to applications such as hydraulics, chiller condensers, and others processes that require cooling water to 85°F. Cooling towers are able to reduce process water temperatures through the cooling effect of evaporation (depending on ambient air temperature and humidity). Learn more. Cooling towers are part of a central system that include a pumping system or Pump Tank Station. Cooling tower cells provide cooling water from 95°F to 85°F (at 78°F wet bulb). Advantage Power Tower® and Temptek TP Series cooling tower cells offer total non-ferrous shell construction with UV protected fiberglass. 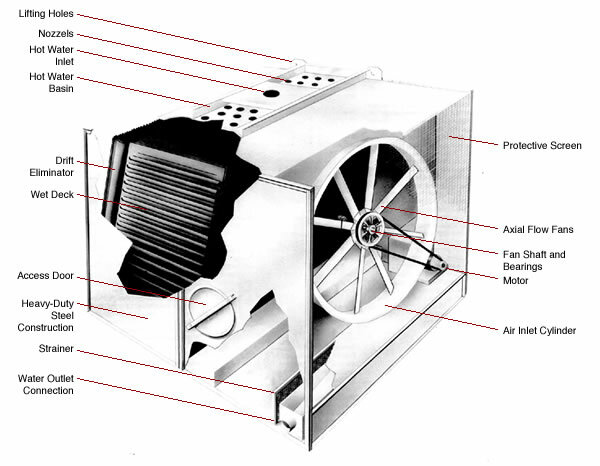 A stainless steel structure supports the direct drive fan assembly with TEFC motor. A structural base is included for roof or stand mounting. Advantage offers detailed plant drawings with every cooling tower system purchase. These cooling towers are ready to meet the needs of today’s industry. Galvanized steel cooling tower supplies inexpensive cooling water for your hydraulics, condensers, temperature controllers, and other machinery. 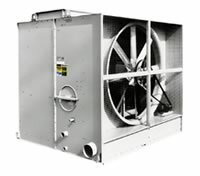 Call Chillers, Inc. for product Warranties! 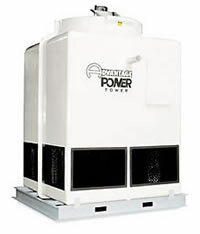 Advantage Power Tower™ Series model PT-135F fiberglass cooling tower shown with standard steel base. 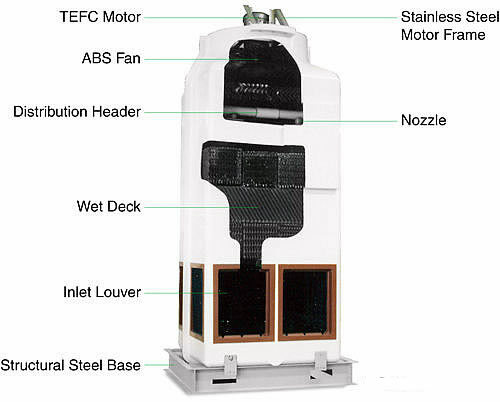 Temptek units are similar in appearance. Temptek PPT Series model PPT-1600-2HP shown with mounted and wired pumps, valves, and motor starters.